Dr. Larry Montgomery graduated from Belton High School in 1975 and never considered opening his practice anywhere else! After his May 1981 graduation, he passed all national and state examinations enabling him to open his practice in Belton on September 21, 1981. He considers Belton the perfect balance of rural America; complete with the values he wanted his family to thrive in and combined with a location that allows easy access to the amenities of Austin, San Antonio, Dallas and Houston. Dr. Micah Montgomery graduated from Belton High School in 2004. After receiving a Bachelor’s degree from John Brown University in Siloam Springs, Arkansas and two Bachelor’s degrees from Parker Chiropractic College in Dallas, he also returned to Belton to care for the people of Central Texas. Dr. Micah takes pride in delivering chiropractic care to the UMHB Football Team, 2016 NCAA Division III National Champions. As chiropractors in Belton, Drs. Montgomery uses the philosophy of treating each patient like his “father/mother, sister/brother.” Therefore, they have built a practice with the latest technologies to, not only, relieve pain for patients but to correct the underlying cause of the pain. 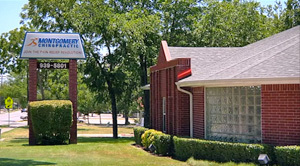 With the small town atmosphere of Belton, the clinic offers an open, friendly and caring clinic where patients become part of the Montgomery Chiropractic Family. “The World Revolves Around Your Spine” is the motto of Montgomery Chiropractic. This statement encompasses the philosophy of our clinic. Whatever the activity you are attempting to involve yourself in, the messages sent from the brain through the spine will determine your ability to accomplish that task. Whether working with athletes of Central Texas’ professional hockey or football teams, or with the growing geriatric population of our nation, the doctors at Montgomery Chiropractic strive to communicate the primary importance of the spine in every activity. The most common cases seen as Montgomery Chiropractic are the “Big Four”: Arm and Leg pain, Carpal Tunnel Syndrome, Headaches and Lower Back Pain. Perhaps the most rewarding case for Dr. Larry Montgomery was when one of his high school teachers brought in her 18 month old grandson. In addition to his asthma, this little boy suffered through more than 30 ear infections, with an equal number of rounds of antibiotics. Since the toddler’s eighth adjustment, he has only experienced two ear infections and three asthma attacks and has now graduated from Belton High School. While we love the children, the senior adults add a new dimension of life to the practice. What a thrill to see them return to the activities they had given up, thinking it was from arthritis, old age or just their nerves! These terms are often used when the real problem has not yet been found. The seniors of Montgomery Chiropractic are active and have the zest for life our creator intended! The ideal patient at Montgomery Chiropractic is one who comes into the clinic to discover solutions to the underlying cause of their current symptomatic state. They not only want to feel better, but want to prevent future recurrences. They appreciate an office that will take the time on the first visit to search in-depth for the root cause of their problem and then on the second visit, provide a detailed explanation of the test results. Additionally, once a well, thought out plan has been formulated, Montgomery Chiropractic is judicious with their time as we handle regular visits efficiently. “As Belton, TX chiropractors, our dream is for a patient’s first adjustment to be before they are 3 months old!”, says Dr. Montgomery. “We want them to address their spinal health at the same time they begin cutting teeth.” If we could educate them at an early age about the effects of chemical, emotional and mechanical interference to their health, the landscape of the world would be changed. Regardless of your health goals, you’re the boss! It’s your body, your health and your future. Our job is to offer you the finest chiropractic care possible and it’s up to you to decide the extent of your care. We conveniently accept most insurances and do offer a time of service discount. Sound interesting? Please contact our Belton chiropractic office to make an appointment today.